The reigning Monster Energy NASCAR Cup Series champion won the award on a high-profile, super-achieving ballot that also included three other 2017 racing champions – Formula One’s Lewis Hamilton, IndyCar’s Josef Newgarden and NHRA’s Top Fuel champion Brittany Force. It marked the third time in the last four years that a NASCAR champion has won the Best Driver category – also including Kyle Busch in 2016 and Kevin Harvick in 2015. And it speaks volumes about the 2017 title chase and Truex’s own story of perseverance – a theme that has boosted him and the small Denver-based Furniture Row Racing team from underdog to championship caliber. “It was a big surprise,’’ Truex said of the ESPY. “I didn’t have any expectations. I thought it was cool to be nominated and I really didn’t think about it much more after that. … I was definitely really surprised (to win) and it was pretty cool. Obviously, like I said, a great honor. Certainly Truex’s amazing 2017 title run made him fully deserving of the ESPN nod. He won a series best eight races – a single season record for himself. And he looked absolutely dominant doing so – ultimately winning the Homestead-Miami season finale to earn his shot to hoist NASCAR’s most sought-after hardware. By all accounts, he’s followed up this year with a similar show of force. His win last weekend at Kentucky Speedway was his fourth of the year – elevating him to championship form again – the third member of a season power trio that also includes five-time winners Harvick and Kyle Busch. The New Jersey-native arrives in New Hampshire for Sunday’s Foxwoods Casino 301 (2 p.m. ET, NBCSN, PRN, SiriusXM NASCAR Radio) ready to make good an especially personal pursuit – finally winning a Monster Energy Series race at the one-mile New England oval where he and his father have raced for decades. 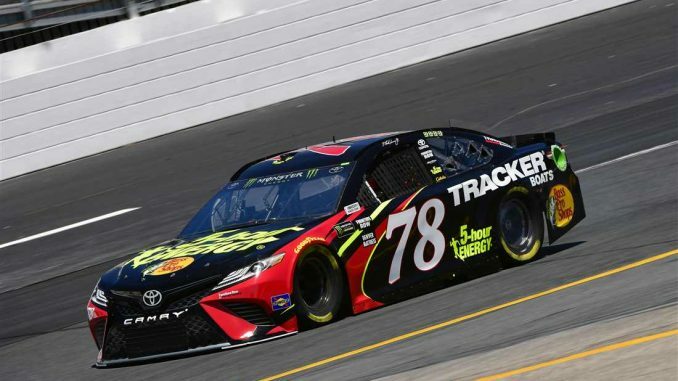 Truex has led 513 laps in the last four Monster Energy NASCAR Cup Series races here only to come up short of victory. He has three top-10 finishes in the last three years. In this race last year, he finished third after earning the pole position and leading a race best 137 of the 301 laps. He has 10 top-10 finishes in 21 Cup starts and scored two of his five top-five efforts in the last two races. That history at the track and his current string of success gives him and the team great hope for the weekend. “We’ve been so strong here the past few seasons,’’ Truex said. “It’s always been a really good track for me over the years and, you know, winning K&N races here, winning Xfinity in ’05 and I really want to get that Cup win because this is a special place for me. Truex will have a pretty good shot Sunday: He qualified second late Friday and will start on the front row.